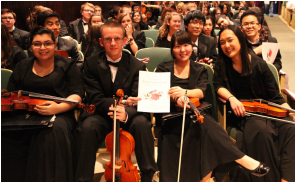 The Elk Grove High School Orchestra program provides a variety of opportunities for students to progress and grow as musicians. Emphasis in the EGHS Orchestras is placed on the development of outstanding playing technique, ensemble skills, musical expressiveness, and an appreciation for diverse styles of music in a supportive learning environment. EG curricular orchestra offerings include Concert Orchestra and Symphony Orchestra. In addition, advanced string players in Concert and Symphony Orchestra may audition for and enroll in Chamber Orchestra. Additional performances opportunities are available to motivated EG Orchestra students, including: District 214 Honors Orchestra, ILMEA District 7 Honors, ILMEA All-State and Honors Orchestras, Musical Pit Orchestra, Jazz Band/Ensemble, and more! 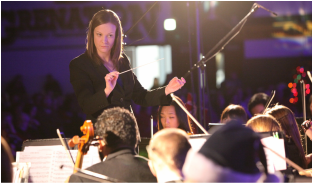 Our orchestras take part in several events throughout the year including music department and orchestra concerts, college festivals and clinics, and performances throughout the Elk Grove community at events and ceremonies. Orchestra students are very involved at EGHS and in the Elk Grove community, and you can find them throughout the school involved in a wide array of activities!